and worst of all, outsourcing so much so that the company loses all in-house knowledge of its own “secret sauce” in the software and loses its competitive advantage. On the vendor side there are often situations where the IT vendor is unintentionally cornered into a no-win “death march” project. The good news is that there is a proven vendor management solution that can reduce or eliminate most of these risks and create a win-win for both purchasers and vendors. 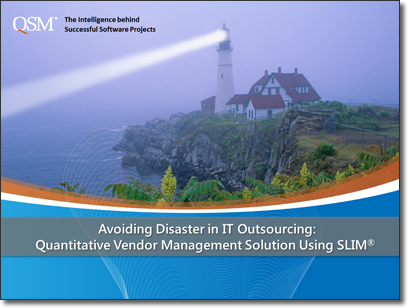 In this session, Joseph Madden, QSM's Vice President of Professional Services, will provide an overview of how leveraging a quantitative solution can improve vendor management on IT contracts. The webinar is based on real-life lessons learned and case studies from QSM - a recognized industry leader and pioneer in the field of software estimation and control.